RD1212 - the Most Convenient Geiger on the market is here! Home » Quarta news » RD1212 – the Most Convenient Geiger on the market is here! 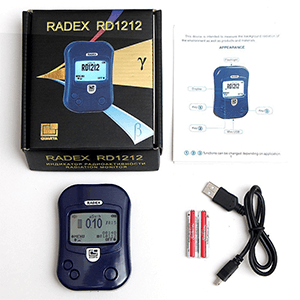 RD1212 – the Most Convenient Geiger on the market is here! After decades of research, Quarta Rad Inc. (part of the MIFI Engineering and Physical Institute) has just released its latest model in the series of hand-held, public-friendly Geiger Counters: the Radex RD1212. This one is light, quick and on good terms with you PC. In other words, unlike other geigers, this little beauty comes with a USB cable and a software, allowing it effortless connection to any computer and a through analysis of recorded data. As far as functionality is concerned, the unit is built around a SBM20-1 Geiger-Muller tube linked with a highly-calibrated software that detects and indicates Gamma, Beta and X-rays radiation in real-time with 10 sec. intervals. This is unique, seeing how almost any other device of its class can only detect one type of radiation, most notably Gamma. 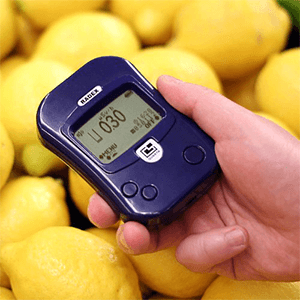 You really should not walk into your local cafe or grocery shop with a common-sized Geiger counter in hand - you will be asked many unpleasant questions and quite possibly escorted off the premises as to not scare other customers. To avoid uncomfortable situations and evil stares from store management, the RD1212 is compact and armed with a vibration alarm, so you can just turn it on, set to vibration alarm and put it in you pocket. Whenever the background radiation level exceeds the specified threshold, the unit will vibrate, alerting you that something suspicious is going on. To be sure, the company has been specializing on radiation detectors since the 1990, and now this latest release is the most competitive new device on the market, loaded with neat and unexpected features such as a built-in flash light, sound and vibration alarms, continuos self-testing and diagnostic tools. This versatile and relatively inexpensive unit does an excellent job of taking fast and accurate readings, visualizing and storing them for analysis. Impressive, to say the least. And now, RD1212 is available worldwide.